FBTBForums.net :: View topic - Voidfighter - Buggestyle, NOW WITH FADING ANIMATION! Voidfighter - Buggestyle, NOW WITH FADING ANIMATION! Posted: Fri Nov 25, 2005 6:23 am Post subject: Voidfighter - Buggestyle, NOW WITH FADING ANIMATION! Woah that's an interesting take on the voidfighter, nice job. Woah...thats like the...booger of SNOTs..thats crazy. Great job. that's what I'm talking about. when this contest started I thought we'd see more great ships like this. I like it muy mucho. Wow! I love those wings. One of the better renditions of the wide, curving wings described in the story. The fuselage is great too, and that cockpit fits in well with the ship. But most of all, thank you for the pics showing how it goes together. As a relatively inexperienced builder, I always appreciate it when more skilled people like yourself reveal the secrets behind their creations. Your page is definetly going in my bookmarks, as a nice example of creative building techniques. Great job. Glad that you liked the construction pictures Barbarossa. There are many others like them in the descriptions of the other mocs on the page. This one is hands down my favorite so far. When I read the story, this is exactly the shape I imagined, and actualy tried to build. But as I'm very out of practice and my parts pile is mostly outdated, I left it half finished and dissapointing. Not much! Other than something totally wacky like a third wing on the top or retractable wings. Landing gear seems to be a problem for everyone, myself included. I like that. It also makes me think of something that could also be a submarine type thing, maybe amphibious? Too bad we don't see too many people with your building skills around these boards! I must voice my dissenting opinion in response to Don and Kazi's unbelievably optimistic posts. Is your voidfighter trying to invte a hug? The source of inspiration is obvious, but you failed to incorporate a significant physical feature of the cylon fighter that inspires fear: its pincer wings. I'm saddened to see the tips of the void's wings snipped off by cruel scissors. They're now a defining characteristic of an implied obtuse character. A white display stand and microscopic landing gear? They're too cheap. However there are redeeming features. The direction of construction is mesmerizing. The choice of windshield is smart. But my intentions are good. So can I get my honest hug now? ... They're now a defining characteristic of an implied obtuse character. Wow! what a surprise to log in and find my tread in the top of the list! It drowned pretty quickly everywhere I presented it, so it's good to see it having a second wind. So the landing gear is just a little extra should it ever need to land on (planet based) platforms. If I should follow that the next section of the wings would be 1 stud wide and 16+2 studs long. And the craft would be almost 50% longer. But I was aiming for a curved version of long narrow glider wings (which aren't pointy), so I like it the way it is: More like dual swords than pincers. 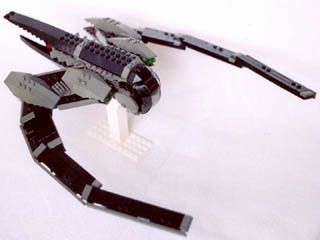 I never had time to rebuild my voidfighter in stealth mode, and do another photo shoot before the deadline. But I thought the fading description sounded cool, so I decided to try and make an animation of it with my mlcad-version of it and pov-ray. You'd been wise to put this fading void against a black backdrop. Natural selection does not favor the black peppered moth on a white birch tree. Unless the tree is covered in soot.